The founder of performance sports car company TVR has died in hospital near his Minorcan home. Trevor Wilkinson, 85, built his first car in 1947 and set up the firm in his home town of Blackpool. He left TVR in 1962 to set up his own engineering company and moved to Minorca later on in life. A statement on the TVR Car club website said he had been aware he was seriously ill "but took it in stoical fashion that was typical of the man". Mr Wilkinson started an engineering apprenticeship after leaving school at 14. In 1946 he bought a wheelwright's business in Blackpool, calling it Trevcar Motors, selling and repairing cars and doing light engineering. The first car he built was a two-seater body on an Alvis Firebird chassis. He then started TVR Engineering, derived from his first name, and was joined by Jack Pickard. Their first car in 1949 was an alloy two-seater body on a multi-tubular steel chassis and the first production TVR was the Mark I, later name Grantura. It had a glass-fibre body which remained, in modified form, until the M-type was replaced by Tasmin in 1980. A spokeswoman at the Mateu Orfila Hospital in Minorca confirmed he had died on Friday. 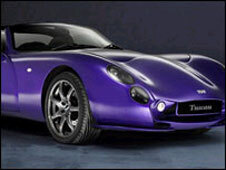 TVR went into administration just before Christmas 2006 with the loss of almost 300 jobs, before being sold back to previous owner Nikolai Smolenski.